This might not be the most psychologically resonant of Steig's picture books, but who can resist his unlikely transformations, flatly related marvels, and dabs of elementary humor? Here Gorky, a dumpy frog, mixes a magic potion. "Ravished by the scent of roses, he recklessly poured in all there was" of his mother's best perfume. That seems to do it. Later, holding the bottled mixture, his slumbering body rises into the air "like a bubble rising in water." He wakens unafraid and sails through the air, to onlookers' amazement. He floats past two rabbits in a balloon (leaving them "flabbergasted" and "electrified from ears to scuts"), ascends through a storm until he is "suspended in the heavens like a coat on a hanger," and finally lets himself down by sprinkling out the magic liquid in discrete drops. 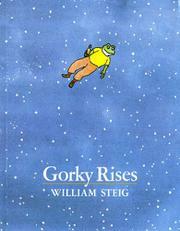 There's no telling how Steig arrived at Gorky's name--or that of his cousin Gogol, who is "goggle-eyed" as Gorky comes rolling by. "He tore after his cousin yelling 'Gorky! Gorky! What's up?'" To which Gorky, of course, replies "I am," and laughs at his cousin's "look of stupid wonder." There are more wonders when Gorky lands, and more puns, with no need for questions and answers. Like Gorky, who seems to float inertly through the clouds, Steig treats the most remarkable events with aplomb, tossing them off as all in a day's dreamwork.